The Flamsteed Radio Astronomy Group was relaunched with a workshop on Tuesday 17th November 2015 at the Royal Observatory Greenwich. 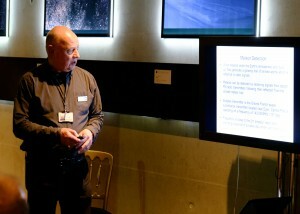 In the 90 minute workshop, Clive explained how to set up simple radio systems for meteor detection and solar flare monitoring. These systems use relatively small radio aerials and cheap equipment, and do not require much technical expertise to set up. The Radio Astronomy Group is not designed to be a lecture group. The aim is to provide practical advice to members who are interested in setting up their own systems, and also provide opportunities to visit other radio astronomy groups and receiving sites. Our next meeting will be on Thursday 4th February 2016.